I used to make hundreds of macarons every day. It was my first real pastry job and to my utter delight, making macarons was a useful thing I could do to ease the workload of the dessert station. They showed me once and off I went, filling big half-sheet plaques with glossy circles of mocha, mint and mandarin. There was a tiny learning curve with a few lopsiders that ended up my belly, but besides that, I remember them being uniform and picturesque, and countless. The sky was the limit, and I marvelled at how such simple ingredients and really not that much work could turn into such marvellous little sculptures with so much texture. My fave cookie, pretty much. Cut to three years later and wanting to dust off my skills, I task my poor non-professional kitchen with the challenge of making respectable macs… which is tricky. A little bit trickier than doing it with industrial equipment… but still possible! It took me three batches until I made something decent, and I learned a lot about my oven and my mixer in the process (“We’ve never really talked like this, and what makes you tick, my sweet oven?”). My hand mixer doesn’t seem powerful enough to make a really strong meringue, which is important and I’ll explain more later, but we got the job done in the end. (Also, the great thing about ugly macarons is that they’re still perfectly delicious. Eat a macaron with every meal and your imagination with grow by one parsec a day; it’s true, the almonds told me). 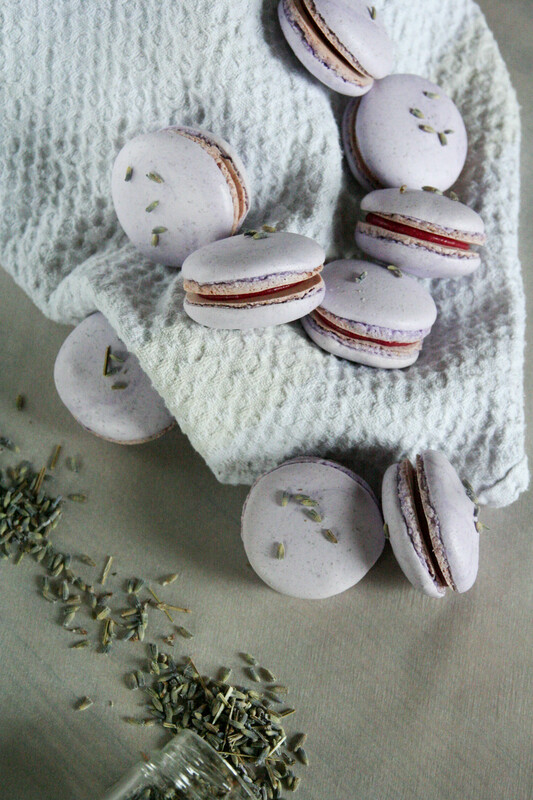 My first two tester batches were chocolate (1 and 2), and by then I was bored of chocolate (haha, yes) and wanted something fun, so I smushed my culinary lavender buds into the proceedings and came up with something juicy and delicate and floral and just the nicest shade of dream-purple. 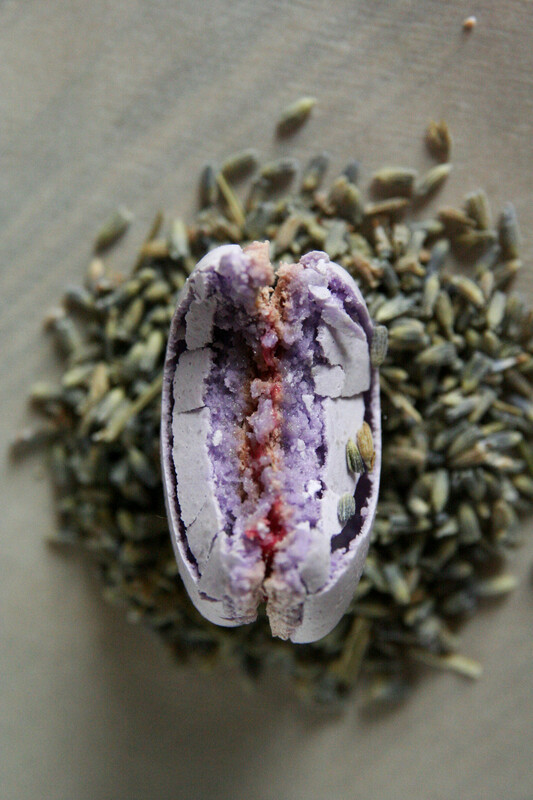 I’m such a sucker for herbal/floral flavours in desserts, and for anyone who isn’t, the raspberry filling grounds things in approachability, and matches swimmingly with the lilting lavender buds. And they turned out. And they have feet. 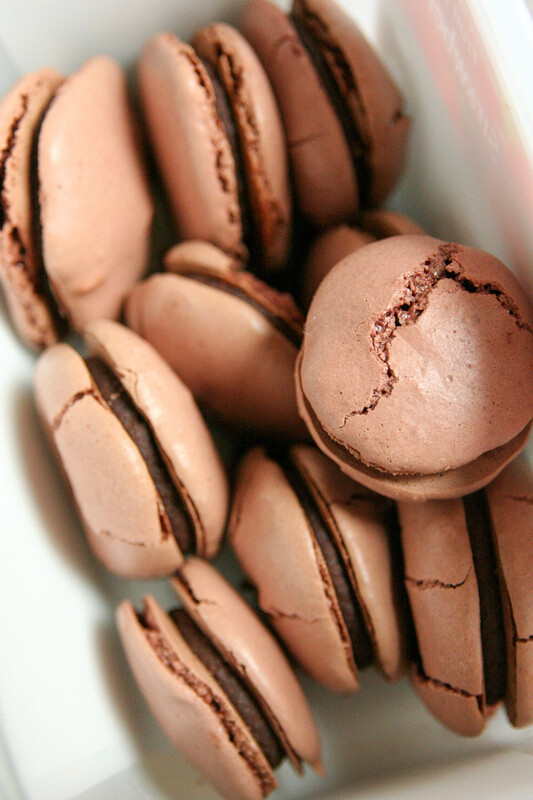 They’re not perfect perfect, but that just means there’s a reasonable excuse to make more macarons in the future. Make thine meringue strong, and extra (over) whipped. Bring it to a bec d’oiseau (bird’s beak) and then whip it some more. You want it to look almost dry and studded with little pocks (bubbles). This ensures that you’ll have enough air in your batter to do a proper macaronage. Macaronage, being that step where you take the light, stiff meringue to the dense, nubbly almond paste and mix them together just enough and no more. It’s an important step that determines how perky your cookies will be (and many other characteristics) but it’s not all that complicated. Just err on the side of under-mixed, stopping when there are no streaks of meringue left at all, and you’ll be fine. Especially if you started with a strong meringue. Know your oven. Know (and avoid) the hot spots. Know the cycles it goes through. Calibrate it if possible and invest a few dollars in an oven thermometer. My oven destroys any macarons in the North-West quadrant, for example, but the gentle heat of the remaining real estate is A-OK). For this recipe I’m only writing the weight measurements. Macarons are a sensitive cookie and need accuracy to thrive. 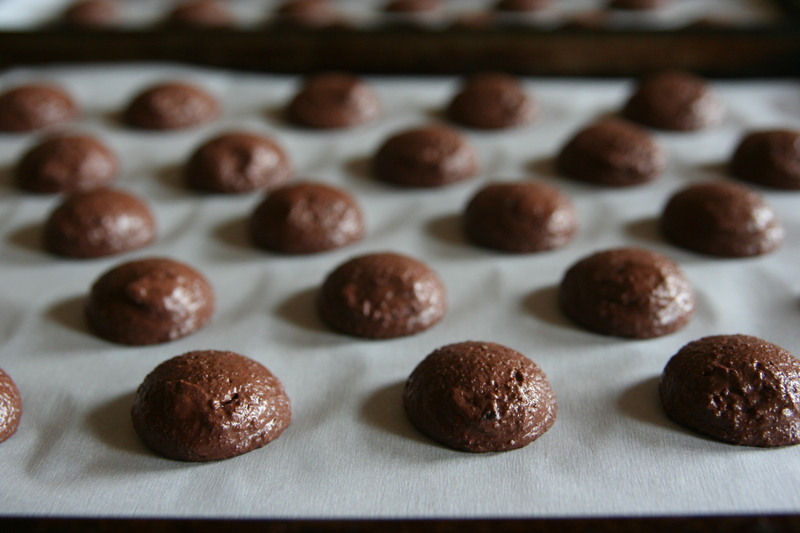 For Macaron Shells: Line three ¼-sheet pans with parchment paper or silicon mats. Prepare a large piping bag with a 1 cm wide circle tip. In a food processor, grind the almonds, icing sugar and dried lavender (if using). When it turns into a fine powder, sift it through a mesh sieve into a large bowl and discard the almond pieces. With a strong spatula, stir in the egg whites and the food colouring to make a thick homogenous paste. Put the second measure of egg whites in the (very clean!) bowl of a stand mixer, or a large non-plastic bowl (also clean!) if using a hand-held mixer. Add the granulated sugar to a small saucepan and drip the water evenly over the top of it. When the sugar is completely moistened, set it over medium high heat and bring to a boil. When the syrup reaches 220℉ (105℃), start whipping the egg whites on medium speed. Whip the whites until they form soft peaks – no more and no less. When the syrup reaches 248℉ (120℃), bring it the egg whites and (while beating on medium-low) pour it steadily in a thin stream down the sides of the bowl, without hitting the beaters. Turn the mixer speed to high and whip the bejeezus out of it, until it’s as stiff as a meringue can get (this could take a while, I can’t tell you how long with a stand mixer but it took 10 minutes with hand-held beaters). Once whipped, put a scoop of meringue into the almond paste and mix it with a spatula to lighten up the mixture. Then add the rest of the meringue (all of it) and fold, fold, fold to incorporate fully. When there are no meringue streaks left you’re probably there. The batter should look stiff enough to pipe, but a little bit “melty”, like cookie lava. Scrape the batter into the prepared piping bag and pipe out little circles at regular intervals onto the baking sheets. WACK the sheets onto counter/table, turn the sheets around and WACK them again (this is super important – it pops any large bubbles that threaten to explode your perfect cookies). Let them stand at room temperature for about 20 minutes. Meanwhile, preheat your oven to about 300-320℉. Set a rack in the middle. Bake one sheet at a time, for about 14-18 minutes. When they seem done, and a cookie lifts up from the sheet, take one out and test it to make sure before pulling the tray out. The outside should be crunchy with a moist middle. Let the macarons sit on the sheet for a minute to adjust to the temperature of the outside world, then lift the paper/silicon mat off the metal tray and pull the cookies onto the table to cool completely. In a small saucepan, heat the raspberries, sugar, butter, and lavender over medium heat until it boils, then cook, stirring often, until thick and reduced like a jam, about 3-5 minutes. Strain the berries through a fine mesh sieve, and let cool before spooning into macaron shells. Pair off the shells and flip one of each pair upside down. Fill and close the pairs, then pack them in an airtight container and refrigerate for one day before eating. Green Almond Pickle for the Food In Jars Mastery Challenge and a Blogger Recognition Award! Wow and more wow. Never attempted making them. Was going to, this week, together with another blogger but had to reschedule. Felt relieved, they really scare me. Thank you for this wonderful recipe and most of all, color and flavor! That’s awesome! I was scared the first time too, but once you try them once it’s not so bad. All the little steps are pretty easy and I know you would rock it! Your flavours are always spot on! Also, this recipe is very basic and reliable, it’s the one I used every day at work. If you’re looking for a french meringue method, I hear that Stella Parks has a good one. Thank you! I’ll let you know how it goes. Yours are amazing! Fantastic recipe! Loved raspberry lavender cream!! They are so pretty! I am daunted though, once I tried to make expresso chip macaroons and I failed! So really nervous….maybe I will try. haha thanks! It was my first time trying to bake macaroons! And after all the work of making them and they not turning out, that was super disappointing! 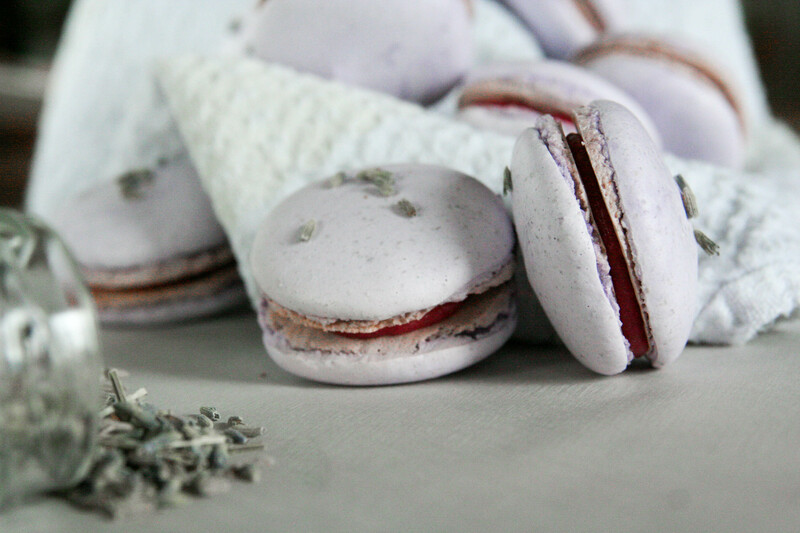 These macarons look lovely and the combination of lavender and raspberry sounds delicious! 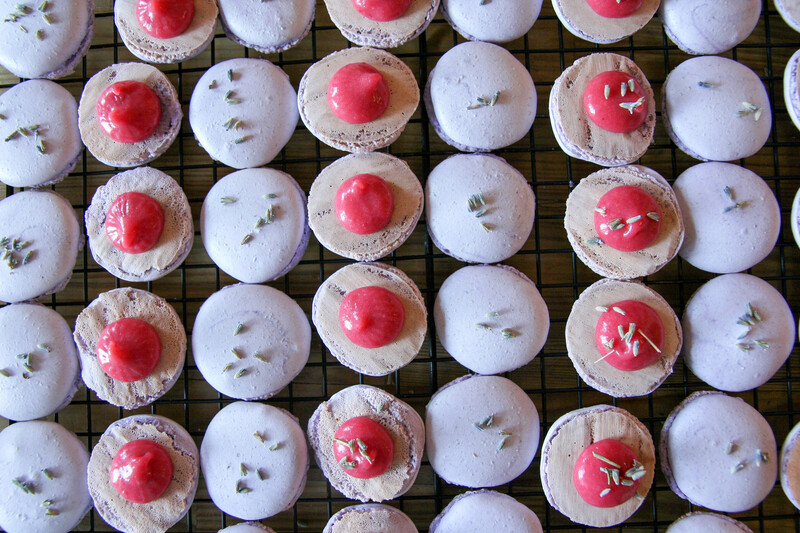 I prefer the Italian meringue method of making macarons like you have used here, although I’ve never bothered with resting them before baking – maybe I’ll try that next time. Thanks for linking to my blog in your sidebar as well. I’ve made macarons only once, and I think they turned out decently. They were not all perfect-looking, but good enough to eat! 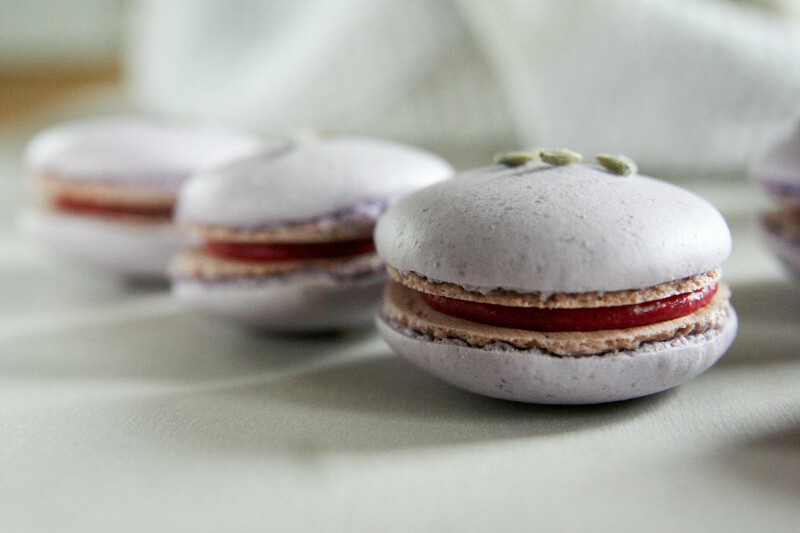 :) These raspberry lavender macarons you made are so nice with their bright colors and I’m sure they were delicious! Very pretty! !